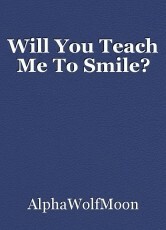 Will You Teach Me To Smile? Emotions are are force I don't reckon with... Can you teach me? What it means to be happy? What it means to smile? Do I need to be taught? It's so nice and touching. I really liked it. And somehow, it's so true. Like we really can't be happy though we have all the things we need to be happy. Like we don't know how to react. And sometimes it's really confusing that should we be or not. And I really liked the last few lines. They are really great. This whole poem is great.